The synaptic vesicle Ca2+ sensor Synaptotagmin binds Ca2+ through its two C2 domains to trigger membrane interactions. Beyond membrane insertion by the C2 domains, other requirements for Synaptotagmin activity are still being elucidated. To identify key residues within Synaptotagmin required for vesicle cycling, we took advantage of observations that mutations in the C2B domain Ca2+-binding pocket dominantly disrupt release from invertebrates to humans. We performed an intragenic screen for suppressors of lethality induced by expression of Synaptotagmin C2B Ca2+-binding mutants in Drosophila. 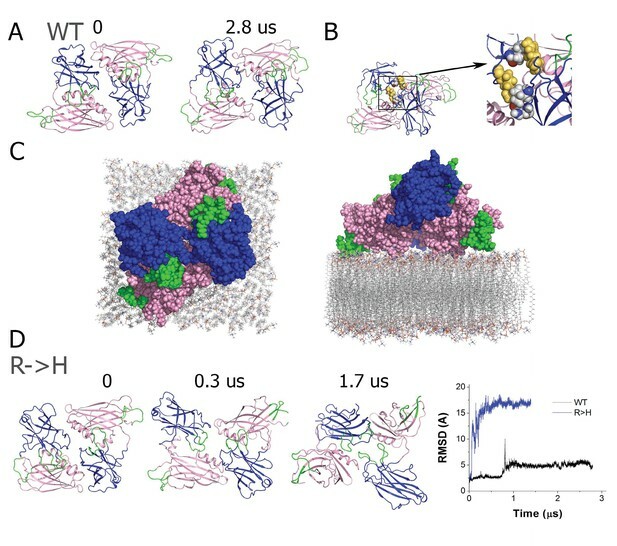 This screen uncovered essential residues within Synaptotagmin that suggest a structural basis for several activities required for fusion, including a C2B surface implicated in SNARE complex interaction that is required for rapid synchronization and Ca2+ cooperativity of vesicle release. Using electrophysiological, morphological and computational characterization of these mutants, we propose a sequence of molecular interactions mediated by Synaptotagmin that promote Ca2+ activation of the synaptic vesicle fusion machinery. Neurotransmitter release requires the rapid fusion of synaptic vesicles in response to Ca2+ influx following an action potential. The SNARE complex is a highly conserved protein machinery that controls the fusion of synaptic vesicles with the plasma membrane (Südhof and Rothman, 2009). Beyond the SNARE complex, neurons have evolved additional mechanisms to regulate the timing and localization of fusion. Among these key regulators is the Synaptotagmin (Syt) family of Ca2+ sensors (Chapman, 2008; Südhof, 2012; Yoshihara et al., 2003). 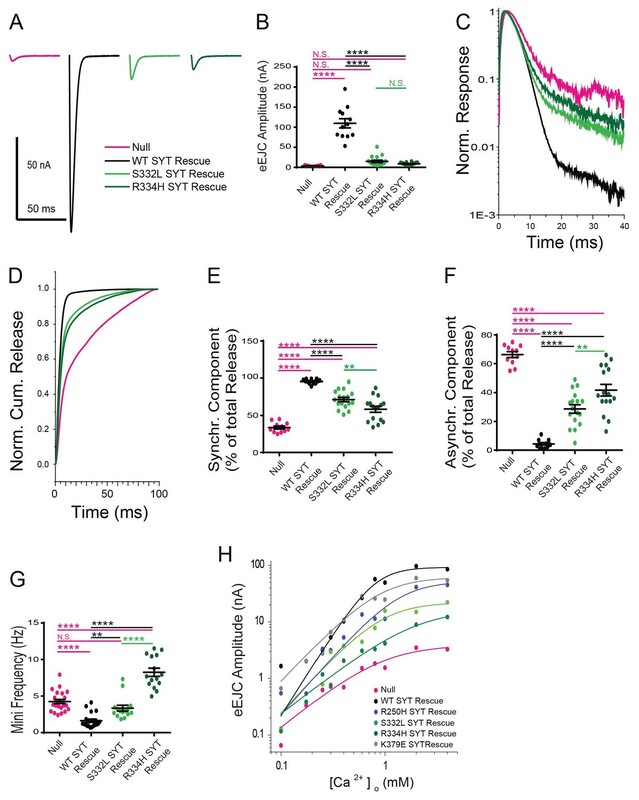 Synaptotagmin 1 (Syt1) functions as the Ca2+ sensor for driving synchronous fusion of synaptic vesicles following an action potential (Geppert et al., 1994; Yoshihara and Littleton, 2002), with other isoforms like Syt7 regulating distinct steps in vesicle cycling (Bacaj et al., 2013; Jackman et al., 2016; Liu et al., 2014; Wen et al., 2010). Syt1 is tethered to synaptic vesicles through a single transmembrane domain and contains two cytosolic Ca2+ binding C2 domains (Perin et al., 1990). The C2 domains, termed C2A and C2B, contain Ca2+-binding loops that emerge from the top of each domain and insert into negatively charged lipid bilayers following Ca2+ influx (Chapman and Davis, 1998; Chapman and Jahn, 1994; Davletov and Südhof, 1993; Desai et al., 2000; Fernandez et al., 2001). Beyond lipid interactions, the mechanistic details of how Syt1 regulates fusion are still being elucidated. Syt1 can interact with the SNARE complex, with several studies suggesting an important role for this interaction during fusion (Bennett et al., 1992; Brewer et al., 2015; Chicka et al., 2008; Choi et al., 2010; Li et al., 1995; Littleton et al., 2001; Lynch et al., 2008; Lyubimov et al., 2016; Pang et al., 2006; Schupp et al., 2016; Zhou et al., 2015). However, not all studies support a Syt1-SNARE binding mechanism during release (Jahn and Fasshauer, 2012; Park et al., 2015). Syt1 also contains a Ca2+-independent lipid-binding surface on one side of the C2B domain that represents a candidate mechanism for docking Syt1 on the plasma membrane, potentially positioning the Ca2+ binding loops near sites where fusion will occur (Bai et al., 2004; Kuo et al., 2009; Loewen et al., 2006; Mackler and Reist, 2001; Pérez-Lara et al., 2016; Rickman et al., 2004; Wang et al., 2016; Young and Neher, 2009). In addition, Syt1 undergoes multimerization (Chapman et al., 1998; Fukuda and Mikoshiba, 2000; Lee et al., 2013; Littleton et al., 2001; Wu et al., 2003; Zanetti et al., 2016), though it is unknown whether a Syt1 monomer or oligomer represents the active state of the protein. Syt1 is abundant on synaptic vesicles, with estimates of the copy number per vesicle ranging from 7 to 15 (Mutch et al., 2011; Takamori et al., 2006). It is possible that Syt1 cycles between distinct conformations and multimeric states, but such mechanisms are unknown. A large-scale identification of key residues within Syt1 that coordinate its activity would represent an important step towards characterizing how Syt1 operates during the fusion cycle. Prior work identified Ca2+ binding to the Syt1 C2B domain as a critical step required for fast synchronous release, with Ca2+ binding to C2A playing an important but more modulatory role in the process (Fernández-Chacón et al., 2001; Lee et al., 2013; Mackler et al., 2002; Nishiki and Augustine, 2004; Shin et al., 2009; Yoshihara et al., 2010). The C2B Ca2+ binding pocket emerges from the top of the domain and contains five negatively charged aspartate residues (numbered D1 to D5) that help coordinate binding of multiple Ca2+ ions (Fernandez et al., 2001). Drosophila strains with mutations in one or more of the D1 to D5 residues in the C2B Ca2+ binding pocket result in a dominant-negative (DN) phenotype, disrupting neurotransmission even in the presence of wildtype Syt1 (Lee et al., 2013; Mackler et al., 2002; Yoshihara et al., 2010). More recently, we identified autosomal dominant mutations in the Ca2+ binding pocket of the C2B domain of human Syt2, a Syt1 homolog enriched in the PNS, that result in an autosomal-dominant disorder presenting with peripheral neuropathy and dysfunctional synaptic transmission at neuromuscular junctions (NMJs) (Herrmann et al., 2014; Whittaker et al., 2015). An autosomal-dominant mutation in the Syt1 C2B domain has also been found in a patient presenting with a more severe neurodevelopmental disorder (Baker et al., 2015). As such, mutations in the Ca2+ binding pocket of C2B (hereafter referred to as C2B DN) result in a dominant disruption of synaptic transmission from invertebrates to humans, potentially through oligomerization with native Syt1 and poisoning of the fusion machinery. The pupal lethality observed following overexpression of UAS-Syt1 C2B DN transgenes in Drosophila allowed us to perform a large-scale F1 ethyl methane sulfonate (EMS) screen for intragenic suppressors. A second site mutation in the Syt1 DN transgene that disrupted the ability of the protein to function properly should abolish or reduce the DN phenotype and allow animals expressing the transgene to survive. This screening approach allowed us to generate a large collection of new mutations in Syt1, with many lines containing mutations of the same amino acid multiple times in independent suppressors. Twenty-two essential residues within Syt1 were identified that are required for the dominant-negative activities of the mutant C2B protein. We characterized mutations that did not disrupt the stability of Syt1 and that mapped to distinct regions that suggested a structural basis for several activities required for vesicle release. These mutations were introduced into the native Syt1 protein in the absence of any C2B Ca2+ binding mutation, allowing us to test their role in normal Syt1 function through electrophysiological, electron microscopy and computational approaches. Our data indicate intra-domain C2A-C2B interactions, the C2B polybasic region, and Synaptotagmin multimerization are important for promoting normal amounts of vesicle fusion, but are not critical for the timing of exocytosis. In contrast, we find a distinct C2B surface opposite the polybasic stretch that is implicated in SNARE complex interactions and required for rapid synchronization and Ca2+ cooperativity of synaptic vesicle fusion. Syt1 contains two C2 domains composed of conserved Ca2+-binding pockets with five negatively charged aspartic acid (or glutamic acid) residues (termed D1 to D5) providing critical sites for Ca2+-mediated lipid interactions (Figure 1A). The neutralization of subsets of these negatively charged Ca2+-binding residues from aspartate to asparagine in the C2B domain results in a DN disruption of synaptic transmission in Drosophila (Lee et al., 2013; Mackler et al., 2002; Yoshihara et al., 2010). Pan-neuronal overexpression of UAS-Syt1C2BD356N,D362N (referred to hereafter as Syt1C2BD1,2N) or UAS-Syt1C2BD416N,D418N (referred to hereafter as Syt1C2BD3,D4N) transgenes with elavC155 GAL4 in otherwise wildtype Drosophila with two endogenous copies of native Syt1 causes late pupal lethality. Animals expressing the transgene undergo normal metamorphosis, but are too weak to emerge from the pupal case. Manual removal of adults from the pupal case revealed severe defects in locomotion, with animals unable to coordinate normal walking or flight. To characterize the underlying defects in synaptic transmission, we performed two-electrode voltage clamp recordings from third instar larvae overexpressing the DN transgenes with elavC155 (Figure 1B–E). We focused on strains overexpressing Syt1C2BD1,2N, but observed similar results following overexpression of Syt1C2BD3,4N (Lee et al., 2013) or Syt1C2BD2A (Herrmann et al., 2014). Overexpression of DN Syt1 resulted in a strong suppression of the evoked response, reducing the evoked excitatory junctional current (eEJC) by 86% compared to controls (white) (Figure 1B,C). In contrast, overexpression of wildtype Syt1 lacking these mutations did not reduce eEJCs. In addition to the strong suppression of synchronous evoked release, the C2B DN mutations also enhanced the rate of spontaneous fusion, increasing mini frequency more than two-fold (Figure 1D,E). The strong reduction in evoked release and elevated mini frequency induced by Syt1C2BD1,2N overexpression in the presence of two endogenous copies of the Syt1 locus largely mimics the effects on synaptic transmission observed in Drosophila syt1 null mutants (Jorquera et al., 2012; Lee et al., 2013; Littleton et al., 1994; 1993; Yoshihara and Littleton, 2002), suggesting the DN transgenic protein may multimerize with and inactivate endogenous Syt1. Alternatively, the DN protein may poison the fusion machinery through other abnormal interactions that disable the release apparatus in a way similar to the loss of native Syt1. An intragenic suppressor screen for mutations that disrupt the lethality induced by Syt1C2BD1,2N or Syt1C2BD3,4N expression. (A) View of key residues in the Syt1 C2B Ca2+ binding pocket. The Ca2+ binding loops 1 and 3 are highlighted in blue, the negatively charged Ca2+-binding residues in green, and Ca2+ ions in red. Neuronal overexpression of Syt1C2BD416,D418N (D1,2N) or Syt1C2BD356,D362N (D3,4N) results in pharate adult lethality. (B) Representative evoked excitatory junctional currents (eEJCs) recorded in 0.2 mM extracellular Ca2+ in control white larvae (black trace), elavC155-GAL4; UAS-Syt1 wildtype (OE WT SYT, blue trace) and elavC155-GAL4; UAS-Syt1C2BD1,2N (OE D1,2N SYT, magenta trace). (C) Quantification of mean eEJC amplitude in the indicated genotypes: control, 116.0 ± 8.7 nA, n = 27; OE WT Syt1, 95.0 ± 9.4 nA, n = 24; OE D1,2N Syt1, 15.9 ± 3.5 nA, n = 10. (D) Representative postsynaptic current recordings of spontaneous release in the indicated genotypes. (E) Quantification of average mini frequency for the indicated genotypes: control, 2.6 ± 0.3 Hz, n = 19; OE WT Syt1, 2.7 ± 0.5 Hz, n = 9; OE D1, 2N Syt1, 5.7 ± 0.8 Hz, n = 15. (F) Crossing scheme used for EMS screening of suppressors of Syt1C2BD1,2N or D3,4N-induced lethality. (G) Location of identified suppressors (point mutant - yellow asterisks, stop codon - white asterisks, deletion - grey asterisks) on the Syt1 secondary structure. C2A is indicated blue and C2B in magenta. (H) View of identified point mutant alleles (yellow) in the DSyt1 homology model. For all remaining structural images, the C2A domain is colored blue and the C2B domain is colored magenta, while the Ca2+ binding loops are highlighted in green. (I) Suppressor point mutants (yellow) located in a space-filling model of DSyt1. (J) Suppressor mutations (yellow) located on the opposite face of the DSyt1 structure compared to panel I. Statistical significance was determined using one-way ANOVA (nonparametric) with post hoc Sidak’s multiple comparisons test. N.S. = no significant change, *p<0.05, **p<0.01, ***p≤0.0005, ****p<0.0001. All error bars are standard error of the mean (SEM). To gain a better understanding of how C2B Ca2+ binding mutations disrupt neurotransmitter release, we performed an intragenic EMS suppressor screen to identify key residues in an unbiased fashion (Figure 1F). Males harboring the toxic Syt1 transgene (Syt1 C2BD1,2N or Syt1 C2BD3,4N) on the third chromosome were mutagenized with EMS and crossed to elavC155 GAL4 females. All F1 progeny from this cross are normally pharate adult lethal. Any mutation that suppressed the ability of the Syt1 C2B Ca2+ binding mutant to exert a DN effect on synaptic function would be expected to generate viable F1 progeny. This provided a fast and robust F1 screening platform to identify important Syt1 residues on a large-scale. The screen could also recover dominant extragenic suppressors that targeted other loci, but we focused only on intragenic suppressors for the current study. Any viable progeny were mated to a third chromosome balancer line to capture the mutated chromosome. Genomic DNA was obtained from progeny of the viable F1 generation and the Syt1 transgene was PCR amplified and sequenced. We screened over 500,000 F1 offspring and identified 105 mutations that produced viable progeny (Table 1). Sequence analysis confirmed 54 of the viable lines contained a premature stop codon that was induced by EMS within the Syt1 transgene, providing an explanation for how the DN effects were eliminated in this subset of suppressors that fail to express the full-length protein. In addition to these stop codons, we identified an additional 22 point mutations present throughout the C2A and C2B domains that resulted in amino acid substitutions that led to viable progeny (Figure 1G–J). We subdivided these point mutations into those that destabilized the protein, leading to reduced expression, versus those that did not alter Syt1 levels by Western analysis (Figure 1—figure supplement 1). Over half of the point mutations identified reduced expression when assayed by Western blotting, suggesting they alter protein stability (Figure 1—figure supplement 1). To facilitate mapping of the mutations, we created a homology model of Drosophila Syt1 (Figure 1H–J) based on the strong conservation with the previously elucidated structure of human Syt1 (Fuson et al., 2007). Throughout the remaining figures, the C2A domain is indicated in blue, the C2B domain in magenta, and the Ca2+ binding loops in green. Many of the mutated residues that reduce DN Syt1 protein levels are embedded in the interior of the protein (i.e. V211 and E245 in Figure 1J), indicating they likely disrupt folding or stability of Syt1. Ten of the remaining amino acid substitutions identified in multiple suppressor lines did not alter the levels of DN Syt1 protein (Figure 1—figure supplement 1). We focused on this category and hypothesized that mutation of these individual residues disrupt key Syt1 interactions required for the DN effects of the C2B Ca2+ binding mutant. Summary of identified alleles that suppress lethality following overexpression of Syt1C2BD1,2N or Syt1C2BD3,4N. The location of the residues is indicated for Drosophila melanogaster, and for the homologous rodent (Rattus norvegicus) residues. The number of independent suppressor hits for each residue is indicated, as well as the location on the Syt1 secondary structure. The result of Western analysis to determine stability of the overexpressed mutant protein is also indicated (D (degraded), S (stable) and NT (not tested)). To determine if the ability of intragenic suppressors to rescue viability is due to protective effects on neurotransmitter release, we analyzed if they altered synaptic physiology compared to overexpression of the UAS-Syt1 C2BD1,2N transgene alone (Figure 2). We focused on specific sets of residues that reside in distinct regions of Syt1 (Figure 2A,E,I,M). We identified several residue changes within the C2A domain that rescued viability (Table 1), including two hits to a previously characterized residue in the C2A Ca2+ binding pocket (D229N) that disrupts C2A Ca2+ binding (Robinson et al., 2002). We previously found that overexpression of Syt1 with mutations in both the C2A and C2B Ca2+ binding sites did not cause dominant-negative defects in release (Lee et al., 2013). Together with the C2A D229N hits from this screen, these data indicate that intact Ca2+ binding by C2A is required for the DN effects of the C2B domain mutations within Drosophila. This contrasts with observations for DN mammalian Syt1, where dual mutations in C2A and C2B do disrupt release (Wu et al., 2017). Although the basis of this species-specific difference is unclear, the C2A domain from Drosophila may be more essential for proper positioning of the DN C2B domain to poison the fusion machinery, a property disrupted by simultaneous loss of C2A Ca2+-activated lipid binding. Characterization of suppressor mutation effects on DN Syt1C2BD1,2N physiology. (A) Location of the R250 residue (yellow) in C2A at the Syt1 dimer interface. (B) Representative eEJCs recorded in 0.2 mM extracellular Ca2+ in control (black), elavC155-GAL4; UAS-Syt1C2BD1,2N (OE D1,2N SYT, magenta) and elavC155-GAL4; UAS-Syt1C2BD1,2N R250H (OE D1,2 N SYT R250H, blue). (C) Quantification of mean eEJC amplitude for the indicated genotypes: control, 116.0 ± 8.7 nA, n = 27; OE D1,2N Syt1, 15.9 ± 3.5 nA, n = 10; OE D1,2 N Syt1 R250H, 105.5 ± 7.5 nA, n = 15. (D) Quantification of average mini frequency for the indicated genotypes: control, 2.6 ± 0.3 Hz, n = 19; OE D1,2N Syt1, 5.7 ± 0.8 Hz, n = 15; OE D1,2N Syt1 R250H, 4.1 ± 0.6 Hz, n = 21. (E) Location of the K379 and T381 residues (yellow) in the C2B polybasic β-strand (grey). (F) Representative eEJCs recorded in 0.2 mM extracellular Ca2+ in control (black), elavC155-GAL4; UAS-Syt1C2BD1,2N (OE D1,2N SYT in magenta) and elavC155-GAL4; UAS-Syt1C2BD1,2N K379E (OE D1,2N SYT K379E, blue). (G) Quantification of mean eEJC amplitude in the indicated genotypes: control, 116.0 ± 8.7 nA, n = 27; OE D1,2N Syt1, 15.9 ± 3.5 nA, n = 10; OE D1,2N Syt1 K379E, 57.7 ± 7.3 nA, n = 10. (H) Quantification of average mini frequency for the indicated genotypes: control, 2.6 ± 0.3 Hz, n = 19; OE D1,2N Syt1, 5.7 ± 0.8 Hz, n = 15; OE D1,2N Syt1 K379E, 5.5 ± 0.4 Hz, n = 11. (I) Location of the P363 residue (yellow) near the C2B Ca2+ binding loops (green). (J) Representative eEJCs recorded in 0.2 mM extracellular Ca2+ in control (black), elavC155-GAL4; UAS-Syt1C2BD1,2N (OE D1,2N SYT, magenta) and elavC155-GAL4; UAS-Syt1C2BD1,2N K379E (OE D1,2N SYT P363S, blue). (K) Quantification of mean eEJC amplitude in the indicated genotypes: control, 116.0 ± 8.7 nA, n = 27; OE D1,2N Syt1, 15.9 ± 3.5 nA, n = 10; OE D1,2N Syt1 P363S, 49.6 ± 11.2 nA, n = 7. (L) Quantification of average mini frequency for the indicated genotypes: control, 2.6 ± 0.3 Hz, n = 19; OE D1,2N Syt1, 5.7 ± 0.8 Hz, n = 15; OE D1,2N Syt1 P363S, 5.1 ± 0.3 Hz, n = 10. (M) Location of the S332, R334, E348, Y391, and A455 residues (yellow) on the C2B surface opposite to the polybasic β-strand (grey). (N) Representative eEJCs recorded in 0.2 mM extracellular Ca2+ in control (black), elavC155-GAL4; UAS-Syt1C2BD1,2N (OE D1,2N SYT, magenta), elavC155-GAL4; UAS-Syt1C2BD1,2N S332L (OE D1,2N SYT S332L, blue) and elavC155-GAL4; UAS-Syt1C2BD1,2N R334H (OE D1,2N SYT R334H, green). (O) Quantification of mean eEJC amplitude in the indicated genotypes: control, 116.0 ± 8.7 nA, n = 27; OE D1,2N Syt1, 15.9 ± 3.5 nA, n = 10; OE D1,2N Syt1 S332L, 56.6 ± 7.0 nA, n = 13; OE D1,2N Syt1 R334H, 122.9 ± 7.8 nA, n = 7. (P) Quantification of average mini frequency for the indicated genotypes: control, 2.6 ± 0.3 Hz, n = 19; OE D1,2N Syt1, 5.7 ± 0.8 Hz, n = 15; OE D1,2N Syt1 S332L, 5.7 ± 0.6 Hz, n = 12; OE D1,2N Syt1 R334H, 4.5 ± 0.5 Hz, n = 7. Statistical significance was determined using one-way ANOVA (nonparametric) with post hoc Sidak’s multiple comparisons test. N.S. = no significant change, *p<0.05, **=p<0.005, ***=p<0.0005, ****=p<0.0001. All error bars are SEM. 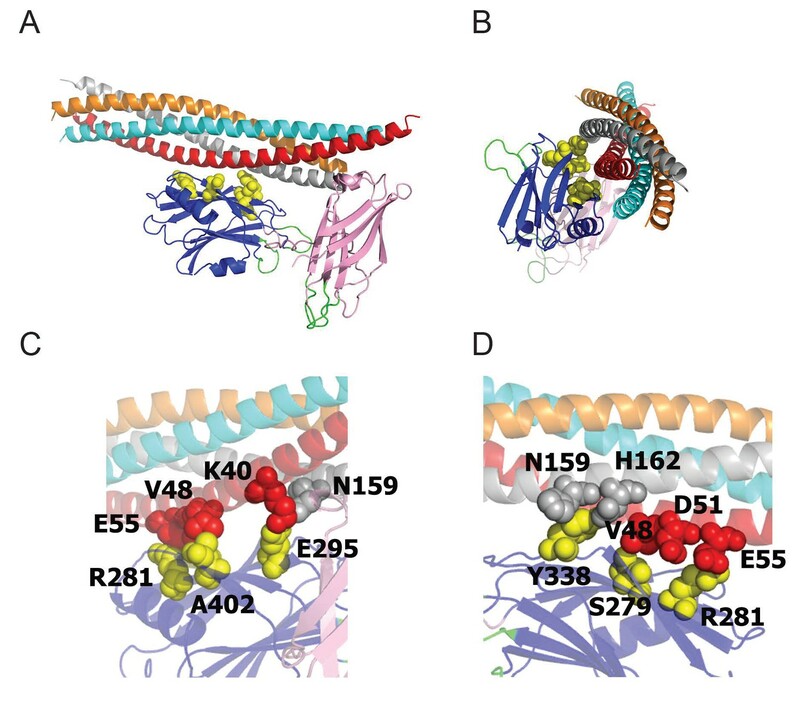 Beyond the C2A Ca2+ binding pocket, three C2A suppressor mutations altered residue R250 (R250H, R250C) located at the interface between the C2A and C2B domains, and near the site of a potential dimer interface from the crystal structure (Figure 2A). To determine if R250H disrupted the effects of the DN C2B Ca2+ binding mutation on synaptic transmission, we performed physiological recording following Syt1 C2AR250H C2BD1,2N overexpression. The R250H mutation completely suppressed the DN effects, with a full recovery of the evoked response to control levels (Figure 2B–C). In contrast, the R250H mutation did not significantly rescue the enhanced spontaneous release (Figure 2D, Figure 2—figure supplement 1). A second group of four suppressors were identified that map onto the polybasic surface of the C2B domain, including K379E and T381﻿ (Figure 2E). The K379 residue in particular has been suggested to function in Ca2+ independent lipid binding that may pre-position Syt1 on the plasma membrane prior to fusion (Loewen et al., 2006; Rickman et al., 2004), and as part of a secondary SNARE binding surface (Brewer et al., 2015). The K379E mutation resulted in a partial suppression of the evoked response defect (Figure 2F–G), but had no significant effect on the enhanced spontaneous release (Figure 2H). These results suggest that docking of the Syt1 C2B domain onto the membrane prior to Ca2+ influx is important for the Syt1C2BD1,2N mutation to fully disrupt fusion. A third category of suppressors was defined by two mutations in P363 (P363S), which maps next to the C2B D2 (D362) Ca2+ binding reside (Figure 2I). A mutation in the homologous residue (P308L) in human Syt2 has been found to cause an autosomal-dominant form of Lambert-Eaton Myasthenic Syndrome in a multigenerational UK family (Herrmann et al., 2014). The P363S mutation partially suppressed the defective evoked response following expression of C2BD1,2N (Figure 2J–K) and had no significant effect on the enhanced spontaneous release (Fig, 2L). Given P363 resides near the C2B Ca2+ binding pocket, we hypothesize this mutation may alter the interaction of the C2B Ca2+ binding loops with membranes or Ca2+ to prevent the DN effects on release. A final group of suppressor mutations identified in the screen mapped to a poorly characterized side of the C2B surface on the opposite face from the polybasic region (Figure 2M). We identified 19 suppressor mutations that disrupted five amino acids (S332, R334, E348, Y391 and A455) that decorate this C2B domain surface. A recent structure of the SNARE complex bound to Syt1 (Zhou et al., 2015) indicates these five residues contribute to the primary interface surface formed between the C2B domain and the SNARE complex (see below). We characterized two of these mutations in more detail (S332L and R334H). The R334H change completely suppressed the ability of the C2BD1,2N mutant to disrupt evoked release, while S332L partially suppressed the evoked defect (Figure 2M–O). Neither mutation was capable of significantly suppressing the increased spontaneous release observed following expression of C2BD1,2N (Figure 2P). These findings indicate that R334 plays an essential function in allowing the DN effects of the C2B Ca2+ binding mutation to be manifested, with S332 contributing slightly less to the process. In contrast to the ability of Syt1C2BD1,2N to dominantly disrupt release, overexpression of transgenes harboring each of the mutations described above (R250H, K379E, P363S, S332L and R334H) in the absence of the C2B Ca2+ binding mutation failed to cause a dominant disruption of synaptic transmission on their own (Figure 2—figure supplement 2). In summary, each of the intragenic suppressors rescue viability by blocking the DN effects the C2B Ca2+ binding mutation on evoked synaptic transmission, but do not significantly alter the effects on spontaneous fusion or disurpt release on their own when overexpressed. In the absence of Syt1, multiple defects in neurotransmitter release occur at Drosophila NMJs. Synchronous synaptic vesicle release is dramatically reduced, asynchronous release is increased, and spontaneous fusion rates rise (Broadie et al., 1994; DiAntonio and Schwarz, 1994; Littleton et al., 1994; 1993; Yoshihara and Littleton, 2002). In addition, there are defects in synaptic vesicle docking (Reist et al., 1998), endocytosis (Littleton et al., 2001; Poskanzer et al., 2006; 2003) and Ca2+ cooperativity of fusion (Littleton et al., 1994; Yoshihara and Littleton, 2002). These results indicate Syt1 plays a multi-functional role in the synaptic vesicle cycle and regulates docking and endocytosis, activates fast synchronous release as the Ca2+ sensor, suppresses slower asynchronous release and acts to prevent spontaneous vesicle fusion. We reasoned that the collection of point mutants from the screen would provide a powerful genetic toolbox to begin to decipher which residues (and by extension, potential binding partners) regulate each of these steps of the synaptic vesicle cycle. To determine how the point mutations alter the normal activity of Syt1 independent of the DN mutations in the C2B Ca2+ binding pocket, we cloned the mutations into the wild type Syt1 transgene. We generated rescue lines expressing the individual point mutants in the syt1 null background. To ensure equal expression among the transgenes and eliminate any genomic position effects, we employed site-specific transformation via the ΦC31 integrase system for transgene insertion (Groth et al., 2004). Immunostaining for Syt1 in third instar larvae of the transgenic rescues indicated each mutant protein was expressed normally at synaptic terminals compared to controls (Figure 3—figure supplement 1A–D), indicating no defect in synaptic localization at this level of resolution. The transgenic mutant proteins were expressed at similar levels to the wildtype Syt1 transgenic rescue by western analysis (Figure 3—figure supplement 1E), though lower that endogenous Syt1 (Figure 3—figure supplement 2A). The reduced levels of Syt1 in the wildtype transgenic rescue resulted in less overall evoked vesicle fusion (Figure 3—figure supplement 2B,C), though release was fully synchronous as seen in controls. As such, we compared all the transgenic rescue lines to the wildtype rescue. We next examined the ability of the transgenic proteins to rescue the lethality normally seen in syt1 null mutants (Figure 3—figure supplement 2D). The wildtype Syt1 transgene robustly rescued lethality, with the R250H and K379E transgenes also generating very significant rescue. In contrast, S332L provided very little rescue, while R334H and P363S failed to rescue the lethality. The lack of the ability of the S332L, R334H and P363S mutant Syt1 proteins to provide significant behavioral rescue argues that these mutations are more likely to significantly disrupt the properties of Syt1 in vivo than R250H and K379E. We first characterized the effects of the C2A R250H mutation that we predicted might alter C2A-C2B domain interactions and Syt1 multimerization. The R250H Syt1 transgene rescued several aspects of the null phenotype, indicating interactions regulated by this residue are not absolutely essential for Syt1 function, consistent with the behavioral rescue we observed. However, evoked neurotransmitter release was decreased by 60% compared to WT Syt1 transgenic rescues (Figure 3A,B). While fusion is largely asynchronous in syt1 null mutants, release in the R250H mutant was synchronous with little asynchronous fusion observed (Figure 3C–F). The R250H mutation had a surprising effect on spontaneous release, with a significant increase in mini frequency compared to controls and null mutants (Figure 3G, Figure 3—figure supplement 3). As such, interactions mediated by R250 play a role in clamping spontaneous release, but do not participate in suppressing the enhanced asynchronous fusion events observed in syt1 nulls. The divergent effects on suppression of spontaneous versus asynchronous release indicate that independent interactions regulate these inhibitory properties of Syt1. We conclude that R250-mediated interactions are important for triggering normal amounts of vesicle fusion during an evoked response, but are not as critical for the timing of fusion. Effects of the R250H mutation on synaptic vesicle fusion. (A) Representative eEJCs recorded in 2.0 mM extracellular Ca2+ in syt1 -/- null larvae (magenta), and null mutants rescued with wildtype Syt1 (WT SYT rescue, black) or R250H Syt1 (R250H SYT rescue, blue). (B) Quantification of mean eEJC amplitudes in the indicated genotypes: null, 3.5 ± 0.4 nA, n = 11; WT Syt1 rescue, 109.7 ± 11.5 nA, n = 12; R250H Syt1 rescue, 44.1 ± 6.8 nA, n = 15. (C) Average normalized responses for each genotype plotted on a semi-logarithmic graph to display release components. (D) Cumulative release normalized for the maximum in 2.0 mM Ca2+ for each genotype. Each trace was adjusted to a double exponential fit. (E) Quantification of the synchronous component of release for each genotype: null, 33.7 ± 2.1%, n = 11; WT Syt1 rescue, 95.6 ± 0.9%, n = 12; R250H Syt1 rescue, 84.0 ± 2.2%, n = 15. (F) Quantification of the asynchronous components of release for each genotype: null, 66.3 ± 2.1%, n = 11; WT Syt1 rescue, 4.4 ± 0.9%, n = 12; R250H Syt1 rescue, 16.0 ± 2.2%, n = 15. (G) Quantification of average mini frequency for the indicated genotypes: null, 4.2 ± 0.3 Hz, n = 23; WT Syt1 rescue, 1.6 ± 0.2 Hz, n = 20; R250H Syt1 rescue, 6.7 ± 0.3 Hz, n = 25. Statistical significance was determined using one-way ANOVA (nonparametric) with post hoc Sidak’s multiple comparisons test. N.S. = no significant change, ****p<0.0001. Error bars are SEM. To determine how R250H may disrupt Syt1 function, we performed molecular modeling to examine how alterations in this residue might change C2A-C2B domain interactions and Syt1 dimerization. We used the mammalian Syt1 crystal structure for modeling analysis. The R199 residue, which is homologous to Drosophila R250, is positioned at interface of the C2A and C2B domains (Figure 1J, Figure 2A). We predicted that mutating the positively charged R250 residue at the interface of the two rigid C2 domains might induce a conformational rearrangement. To explore this possibility, we performed prolonged molecular dynamics (MD) simulations of native and R199H mammalian Syt1 (Figure 4). We first investigated the stability of the native Syt1 conformational state observed by crystallography by performing MD simulations at the microsecond scale in a water/ion environment. The MD trajectory (Figure 4A–D) demonstrated that the domains remain relatively stable, though minor conformational transitions were observed. More specifically, the inter-domain organization remained stable for approximately 1 µs (Figure 4D, states 1–3), with only minor and transient separations between the C2 domains (Figure 4D, state 1; note minor fluctuations in the root mean-square deviation (RMSD) and gyration radius around the 0.5 µs time point, Figure 4A–C). This was followed by a period of instability (transient raise in RMSD around 1.2–1.5 µs, Figure 4A,B). This instability was associated with a separation of the C2 domains (transient increase in gyration radius, Figure 4C) and inter-domain rotation (Figure 4D, state 3). Subsequently, the structure transitioned to a different state with tightly interacting C2 domains (Figure 4D, state 4), which was stable for the remainder of the observed trajectory (Figure 4A–C, 1.8–3.3 µs). This conformation was fairly similar to initial state 0: the C2A and C2B domains were perpendicularly oriented and interacted with the Ca2+ binding loops of the C2A domain, forming contacts with a C2B alpha helix. These results suggest that although Syt1 is likely to undergo minor conformational rearrangements in solution, the organization observed by crystallography with perpendicularly oriented and tightly interacting domains is likely to be stable. Interestingly, in the final state of the Syt1 trajectory, R199 is positioned at the interface of the tightly interacting C2A and C2B domains (Figure 4E). The R199H mutation (homologous to Drosophila R250H) drastically enhances Syt1 conformational flexibility. (A) RMSD computed for backbone atoms of mammalian Syt1 along the MD trajectory. Note a region of instability between 0.5 and 1 µs, which is followed by a conformational transition. Arrows indicate the states shown in D. (B) Backbone RMSD per frame along the trajectory. Note a region of instability in the middle of the trajectory, followed by a relatively stable state (state 4, panel D) between 1.8 and 3.3 µs of the simulation. (C) Gyration radius along the trajectory indicating the separation between domains. Note a transient separation of the domains at 1.2–1.3 µs, which is followed by a decrease in gyration radius, corresponding to tightening of the overall structure. (D) Subsequent states of Syt1 along the trajectory. Note that the organization of the domains remains stable from state 0 to state 2, with a light separation of the domains in state 1. The transient state 3 has separated domains with the Ca2+-binding loops facing the same surface. This state transitions to a stable state 4 with Ca2+ binding loops of the C2A domain interacting with the alpha-helix of the C2B domain, similar to the initial state 0. (E) In the final state of the Syt1 trajectory, residue R199 (yellow) is positioned at the interface of the C2A and C2B domains. (F) RMSD for R199H Syt1 shows a major conformational transition in the beginning of the trajectory, as well as a lack of overall stability. (G) RMSD for R199H Syt1 shows multiple conformational transitions, especially in the second half of the trajectory. (H) The gyration radius of R199H Syt1 shows a separation of the domains in the beginning of the trajectory, followed by major fluctuations, corresponding to transient separation and tightening of the domains. (I) Subsequent states of R199H Syt1 along the trajectory show major rearrangements of the domains. (J) The trajectory of R199H Syt1 has an RMSD distribution shifted to the right, indicating more prominent conformational transitions. Note two closely positioned peaks in the WT distribution, corresponding to two stable conformational states along the trajectory. In contrast, the trajectory of mutated Syt1 shows five RMSD peaks, corresponding to five different conformations, all shifted to the right and considerably deviated from the initial state. (K) The RMSD per frame distribution is shifted for R199H Syt1, demonstrating more prominent conformational changes from frame to frame. (L) The gyration radius distribution is shifted in mutant Syt1, demonstrating a larger separation between the domains. We next explored how the R199H mutation would affect the dynamics of the Syt1 C2 domains (Figure 4F–I). Strikingly, the mutation drastically destabilized the Syt1 inter-domain organization. After a brief period of stability (0.15 us), the domains separated (note a jump in RMSD in Figure 4F and a peak in gyration radius in Figure 4H), and multiple conformational transitions followed (Figure 4I). The entire conformational dynamics (Figure 4F–L), including the overall RMSD (Figure 4F,J) and the extent of the conformational rearrangements (Figure 4G,K), was drastically affected by mutation of R199. Importantly, the mutated Syt1 structure had an increased gyration radius (Figure 4H,L), indicating a larger separation of the C2 domains likely causes the conformational transitions. This structural flexibility contrasts with native Syt1 dynamics, where domains interact tightly and conformational transitions are minor and infrequent (Figure 4J–L). Multiple studies suggest Syt1 multimerization may be important in vivo. As such, we next explored the stability of the Syt1 dimer in solution, how it might assemble at the interface of the synaptic vesicle and plasma membrane, and how conformational dynamics of a Syt1 dimer would be affected by the R199H mutation. Since the Syt1 structure obtained by crystallography represented a dimer (Fuson et al., 2007), we used the dimer as an initial approximation for energy minimization followed by a 2.8 µs MD simulation in a water/ion environment. We found the dimer remained stable and underwent only subtle rearrangements of the loop regions, but inter-domain and monomer re-arrangement did not occur (Figure 5A), and no major conformational transitions were observed. The dimer was stabilized by hydrophobic interactions of R199, which formed a salt bridge with N207 and tight hydrophobic contacts with V205 (Figure 5B). The MD stimulation of the Syt1 dimer suggest the structure observed by crystallography is likely to be stable in solution and not an artifact of crystallization. The R199H mutation destabilizes the Syt1 dimer. (A) The dimer structure of native Syt1 is stable in the water/ion environment at the microsecond time scale. Note similar arrangements of monomers and dimers in the initial and final states. (B) The R199 residue (yellow) is central in van der Waals interactions between Syt1 monomers that form the dimer structure. (C) Structural model of the Syt1 dimer on top of the plasma membrane from a top-down view (left) and a perpendicular view to the membrane (right). Note the polybasic region of the C2B domain (magenta) interacts with the membrane, positioning the C2B Ca2+ binding loops (green) near the plasma membrane. In contrast, the Ca2+ binding loops (green) of the C2A domain (blue) face the opposite side of the structure, and could serve to interact with the synaptic vesicle membrane to bridge the two bilayers. (D) The dimeric structure of Syt1 is disrupted in the R199H mutant. Three states along the trajectory of the mutated dimer show a major rearrangement of the domains. The RMSD plot on the right reveals a major conformational transition at the beginning of the trajectory of R199H Syt1 (blue trace) compared to the trajectory of native Syt1 (black trace). To explore how a Syt1 dimer might interface between the two membranes involved in fusion, we created a model of the dimer on the lipid bilayer surface by positioning it on a plasma membrane bilayer and performing energy minimization (Figure 5C). Notably, the C2B polybasic stretch from residues 321 to 327 (KELKKKK) of both Syt1 monomers engaged the lipid bilayer, positioning the C2B Ca2+ binding loops oriented towards the plasma membrane (Figure 5C). In contrast, the Ca2+ binding loops of the C2A domains emerged from the opposite side of the structure, indicating they may interact with the synaptic vesicle lipid bilayer rather than the plasma membrane. Such an arrangement suggests a model whereby the Syt1 dimer could act as an intermediate in the fusion pathway. We hypothesize that the Syt1 dimer could stabilize a state with the synaptic vesicle and the plasma membrane in close proximity, but not merging, thus inhibiting spontaneous fusion. Ca2+ binding would then induce penetration of the C2B domains into the plasma membrane and penetration of the C2A domains into the vesicle membrane, bridging the two membranes to create tension and promote stalk formation and fusion pore opening. The central site of R199 at the Syt1 dimer interface (Figure 5B) suggests that mutating this residue could destabilize dimer formation. To test this prediction directly, we performed MD simulations of the mutated Syt1 dimer and observed that dimer structure and organization was substantially disrupted (Figure 5D). Within the initial 0.5 µs of the MD trajectory (Figure 5D), both monomers underwent conformational transitions associated with inter-domain rotation, and subsequently the structure transitioned into a state where the symmetric organization of the monomers was disrupted and the Ca2+ binding loops of the C2A domains faced different surfaces of the dimer (Figure 5D, 1.7 µs time point). This transition is illustrated by the major RMSD deviation of the mutated dimer from its initial state (Figure 5D). This result suggests that although dimerization may still occur in the R250H mutant background, the dimer structure observed for native Syt1 would be less stable. We next examined how the K379E mutation alters Syt1 function. K379 resides on the C2B domain polybasic strand and has been suggested to dock Syt1 onto the plasma membrane in a Ca2+-independent manner. We generated the K379E mutation in the Syt1 wildtype transgene and expressed it in the null background. In contrast to the robust ability of the K379E mutation to disrupt the dominant-negative effects of the C2B Ca2+ binding mutants on fusion, the mutation had only modest effects on wildtype Syt1 activity and was able to significantly rescue the lethality observed in the syt1 null mutant. Release in the K379E mutation background was synchronous, with little asynchronous release observed (Figure 6A–F). The primary defect identified was a ~ 50% reduction in the evoked EJC amplitude (Figure 6A,B), indicating K379 regulates the total amount of vesicles that fuse, but does not play a critical role in release timing or the suppression of asynchronous release. The K379E mutation did not rescue the enhanced spontaneous neurotransmitter release observed in the null mutant (Figure 6G). We conclude that the polybasic motif in the C2B domain promotes normal levels of synaptic vesicle release, but is not essential for the process and does not play an important role in suppressing asynchronous fusion. Physiological analysis of the K379E and P363S mutants on neurotransmitter release. (A) Representative eEJCs recorded in 2.0 mM extracellular Ca2+ in syt1 -/- null larvae (magenta) and null mutants rescued with WT Syt1 (black), P363S Syt1 (purple) or K379E Syt1 (grey). (B) Quantification of mean eEJC amplitude for the indicated genotypes: null, 3.5 ± 0.4 nA, n = 11; WT Syt1 rescue, 109.7 ± 11.5 nA, n = 12; P363S Syt1 rescue, 9.8 ± 1.7 nA, n = 20; K379E Syt1 rescue, 57.3 ± 4.9 nA, n = 20. C. Average normalized responses plotted on a semi-logarithmic graph to display their components. (C) Average normalized responses for each genotype plotted on a semi-logarithmic graph to display release components. (D) Cumulative release normalized for the maximum in 2.0 mM Ca2+ for each genotype. Each trace was adjusted to a double exponential fit. (E) Quantification of the synchronous components of release for each genotype: null, 33.7 ± 2.1%, n = 11; WT Syt1 rescue, 95.6 ± 0.9%, n = 12; P363S Syt1 rescue, 76.8 ± 3.2%, n = 20; K379E Syt1 rescue, 91.8 ± 1.1%, n = 20. (F) Quantification of the asynchronous components of release for each genotype: null, 66.3 ± 2.1%, n = 11; WT Syt1 rescue, 4.4 ± 0.9%, n = 12; P363S Syt1 rescue, 23.2 ± 3.2%, n = 20; K379E Syt1 rescue, 8.2 ± 1.1%, n = 20. (G) Quantification of average mini frequency for the indicated genotypes: null, 4.2 ± 0.3 Hz, n = 23; WT Syt1 rescue, 1.6 ± 0.2 Hz, n = 20; P363S Syt1 rescue, 2.4 ± 0.2 Hz, n = 21; K379E Syt1 rescue, 4.0 ± 0.3 Hz, n = 23. Statistical significance was determined using one-way ANOVA (nonparametric) with post hoc Sidak’s multiple comparisons test. N.S. = no significant change, ***p<0.0005, ****p<0.0001. All error bars are SEM. The P363S mutation is located near the C2B Ca2+ binding D2 site (D362), suggesting it may disrupt the ability of the C2B domain to insert into lipid bilayers in a Ca2+-dependent manner. We generated the P363S mutation in the Syt1 wildtype transgene and expressed the construct in the syt1 null background. The P363S mutation resulted in a severe reduction in evoked EJC amplitude (Figure 6A,B), as well as altering synchronous versus asynchronous components of release (Figure 6C–F). Similar to the null mutant, the amount of asynchronous release was dramatically increased (Figure 6C,D,F). These observations are consistent with previous results indicating the C2B Ca2+ binding domain is an essential trigger for synaptic vesicle exocytosis. The P363S transgene largely rescued the enhanced spontaneous release observed in the null mutant (Figure 6E), suggesting this residue does not play a major role in helping Syt1 function as a clamp for spontaneous release. We next examined how mutations on the C2B domain surface opposite the polybasic stretch alter Syt1 function. Resides S332 (corresponding to mammalian S279) and R334 (corresponding to mammalian R281) decorate the primary interface of the recently identified Syt1-SNARE binding surface (Zhou et al., 2015) (Figure 7A,B). Residue R334 has a prominent role in the Syt1-SNARE complex by forming a salt bridge with residue E55 of SNAP25, while S332 participates in weaker hydrophobic SNAP-25 interactions (Figure 7C,D). As such, these mutations would be predicted to disrupt SNARE-Syt1 interactions in vivo. We generated S332L and R334H mutations in the wild type Syt1 transgene and expressed them in the syt1 null background (Figure 8). Compared to control rescues, mutations at these sites severely disrupted the ability of Syt1 to support synchronous exocytosis (Figure 8A,B) and failed to rescue most Syt1-dependent functions. The R334H mutation had a more severe phenotype compared to S332L, consistent with the location of R334 at the center of the Syt1-SNARE interaction surface. In contrast to the effects of the R250H and K379E mutations on release, S332L and R334H rescue lines failed to suppress asynchronous release, similar to what is observed in the syt1 null (Figure 8C–F). As such, Syt1-SNARE interactions are likely to be essential for both driving synchronous fusion and preventing activation of release through the asynchronous pathway. In addition to their effects on the amount and timing of evoked release, both mutations failed to suppress enhanced spontaneous release (Figure 8G). Notably, mutations in R334 had an even larger increase in mini frequency than the null mutant, indicating Syt1-SNARE interactions are critical for preventing spontaneous exocytosis of synaptic vesicles in the absence of Ca2+ influx. The Syt1-SNARE interaction surface (Zhou et al., 2015) reveals that residues S332 (S279 in mammalian Syt1), R334 (R281), Y391 (Y338), E348 (E295), and A455 (A402) are positioned at the Syt1-SNARE interface. All five residues were identified as suppressors in our genetic screen. (A,B) Two perpendicular views of the Syt1-SNARE complex are shown. The residues listed above are shown in yellow. Orange – synaptobrevin; cyan – syntaxin; red – SN1 domain of SNAP25; silver – SN2 domain of SNAP25. (C,D) Magnified views of opposite surfaces of the Syt1-SNARE interface are shown. Note that the Syt1-SNARE interaction is supported by a salt bridge between R334 (R281) of Syt1 and E55 of SNAP25. In addition, S332 (S279) forms hydrophobic interactions with V48 of SNAP25. Effects of the S332L and R334H mutations on neurotransmitter release. (A) Representative eEJCs recorded in 2.0 mM extracellular Ca2+ in syt1 -/- null larvae (magenta) and null mutants rescued with WT Syt1 (black), S332L Syt1 (light green) or R334H Syt1 (dark green). (B) Quantification of mean eEJC amplitudes for the indicated genotypes: null, 3.5 ± 0.4 nA, n = 11; WT Syt1 rescue, 109.7 ± 11.5 nA, n = 12; S332L Syt1 rescue, 14.9 ± 3.0 nA, n = 17; R334H Syt1 rescue, 8.8 ± 0.9 nA, n = 16. (C) Average normalized responses plotted on a semi-logarithmic graph to display their components. (D) Cumulative release normalized for the maximum in 2.0 mM Ca2+ for each genotype. Each trace was adjusted to a double exponential fit. (E) Quantification of the synchronous components of release for each genotype: null, 33.7 ± 2.1%, n = 11; WT Syt1 rescue, 95.6 ± 0.9%, n = 12; S332L Syt1 rescue, 71.3 ± 2.9%, n = 17; R334H Syt1 rescue, 58.3 ± 4.0%, n = 16. (F). Quantification of the asynchronous components of release for each genotype: null, 66.3 ± 2.1%, n = 11; WT Syt1 rescue, 4.4 ± 0.9%, n = 12; S332L Syt1 rescue, 28.7 ± 2.9%, n = 17; R334H Syt1 rescue, 41.8 ± 4.0%, n = 16. (G) Quantification of average mini frequency for the indicated genotypes: null, 4.2 ± 0.3 Hz, n = 23; WT Syt1 rescue, 1.6 ± 0.2 Hz, n = 20; S332L Syt1 rescue, 3.3 ± 0.4 Hz, n = 15; R334H Syt1 rescue, 8.3 ± 0.5 Hz, n = 15). For panels B-G, statistical significance was determined using one-way ANOVA (nonparametric) with post hoc Sidak’s multiple comparisons test. N.S. = no significant change, **=p < 0.01, ****=p < 0.0001. All error bars are SEM. (H) Ca2+ cooperativity of release is shown on a double logarithmic plot, with Hill fit for each genotype. Ten extracellular Ca2+ concentrations (mM) were tested: 0.1, 0.175, 0.25, 0.3, 0.4, 0.6, 0.8, 1, 2, 4. The cooperativity for the genotypes is (value ±standard error): null, 1.5 ± 0.4 (n = 102); WT Syt1 rescue, 2.9 ± 0.7 (n = 119); R250H Syt1 rescue, 2.1 ± 0.6 (n = 112); S332L Syt1 rescue, 2.0 ± 0.6 (n = 112); R334H Syt1 rescue, 1.4 ± 0.2 (n = 112); K379E Syt1 rescue, 1.9 ± 0.6 (n = 118). Regression analysis revealed significant differences in the WT Syt1 rescue (p<0.0001) and R334H Syt1 rescue (p<0.05) compared to null. The R250H Syt1 rescue (p<0.05) and the S332L Syt1 rescue (p<0.0001) were significantly different compared to WT Syt1 rescue. At least 6 recordings were performed in each concentration, with n indicating the total number of recordings in the 10 different Ca2+ concentrations. In addition to regulating synchronous and asynchronous release, binding of Ca2+ by Syt1 is a key component of the higher order Ca2+ cooperativity (n = ~3–5 depending on synapse) observed for synaptic vesicle fusion (Kaeser and Regehr, 2014; Littleton et al., 1994; Yoshihara and Littleton, 2002). In addition, Syt1 participates in synaptic vesicle docking (Reist et al., 1998) and endocytosis (Littleton et al., 2001; Poskanzer et al., 2006; 2003). To examine the effects of the suppressor mutations on these synaptic parameters, we examined Ca2+ cooperativity of release (Figure 8H) and performed EM analysis (Figure 9) on the transgenic rescue lines for several of the point mutants. For Ca2+ cooperativity measurements, we assayed the evoked EJC amplitude in 10 different extracellular Ca2+ concentrations ranging from 0.1 mM to 4 mM. Ca2+ cooperativity in control animals (WT SYT rescue) was 2.9, compared to 1.5 in syt1 null mutants. The most dramatic effect on Ca2+ cooperativity was observed in the R334H rescue, where the Ca2+ dependence of release was reduced to 1.4, similar to the syt1 null. These data indicate that Syt1-SNARE binding mediated by the R334 residue is a key determinant of the Ca2+ cooperativity for synaptic vesicle fusion. Ultrastructural synaptic defects in syt1 mutations. (A) Representative electron micrographs of third instar synaptic boutons from the NMJ of syt1 null mutants rescued with the indicated transgenic lines. A 2X-magnified view of the T-bar is shown in the insert. Enlarged vacuolar structures prominent in the R250H rescue line are marked by a white arrowhead. Enlarged membrane invaginations in the R250H rescue are indicated by a white arrow. The scale bar is 0.2 μm. (B) Quantification of synaptic vesicle number located underneath the T-bar (near T-bar) or within 100 nm, 100–150 nm or 150–200 nm radius from the T-bar for the indicated genotypes. Quantification of vesicle number near T-bar for each genotype: null, 0.58 ± 0.16, n = 24; WT rescue, 1.5 ± 0.1, n = 20; R250H rescue 1.3 ± 0.1, n = 30; S332L rescue, 1.3 ± 0.1, n = 21; R334H rescue, 1.1 ± 0.1, n = 29; K379E rescue, 1.3 ± 0.2, n = 23. Quantification of vesicle number within 100 nm radius area around T-bar for each genotype: null, 2.3 ± 0.4, n = 24; WT rescue, 4.2 ± 0.2, n = 20; R250H rescue 3.3 ± 0.3, n = 32; S332L rescue, 4.0 ± 0.3, n = 21; R334H Rescue, 3.9 ± 0.2, n = 29; K379E Rescue, 3.2 ± 0.3, n = 23. Quantification of vesicle number within 100–150 nm area around T-bar for each genotype: null, 4.0 ± 0.5, n = 24; WT rescue, 6.9 ± 0.5, n = 20; R250H rescue 5.4 ± 0.3, n = 32; S332L rescue, 4.0 ± 0.3, n = 21; R334H rescue, 5.0 ± 0.3, n = 29; K379E rescue, 3.7 ± 0.4, n = 23. Quantification of vesicle number within 150–200 nm area around T-bar for each genotype: null, 3.2 ± 0.5, n = 24; WT rescue, 7.9 ± 0.5, n = 20; R250H rescue 5.5 ± 0.4, n = 32; S332L rescue, 7.7 ± 0.4, n = 21; R334H rescue, 7.3 ± 0.5, n = 29; K379E rescue, 4.3 ± 0.5, n = 23. Quantification of sum of vesicle number within 200 nm area around T-bar for each genotype: null, 9.3 ± 1.2, n = 24; WT SYT rescue, 18.9 ± 0.9, n = 20; R250H SYT rescue 14.3 ± 0.6, n = 32; S332L SYT rescue, 17.4 ± 0.7, n = 21; R334H SYT rescue, 16.1 ± 0.7, n = 29; K379E SYT rescue, 11.2 ± 0.9, n = 23. (C) Synaptic vesicle number was quantified and normalized to bouton area. Syt1 null mutants have a prominent reduction in vesicle number compared to control Syt1 rescued lines. Quantification of vesicle density for each genotype: null, 38.7 ± 7.5, n = 14; WT SYT rescue, 164.0 ± 7.4, n = 31; R250H SYT rescue 89.7 ± 6.6, n = 38; S332L SYT rescue, 177.3 ± 11.1, n = 18; R334H SYT rescue, 120.0 ± 6.9, n = 35; K379E SYT rescue, 79.6 ± 8.0, n = 20. Statistical significance was determined using one-way ANOVA (nonparametric) with post hoc Sidak’s multiple comparisons test. N.S. = no significant change, *p<0.05, **p≤0.01, ***p≤0.0005, ****p<0.0001. All error bars are standard error of the mean (SEM). To examine synaptic ultrastructure in the rescue lines, we performed transmission electron microscopy (TEM) on third instar larval NMJs and quantified synaptic vesicle density within boutons (Figure 9A,C) and vesicle distribution surrounding active zone T-bars (Figure 9B). Two primary defects were observed in syt1 null mutants compared to wildtype Syt1 transgenic rescue lines. First, there was a 4-fold decrease in the total density of synaptic vesicles within nerve terminals (Figure 9A,C), consistent with the role of Syt1 in vesicle endocytosis. In addition, there was a 60% reduction in docked synaptic vesicles directly underneath the T bar (Figure 9B). Expression of a wildtype Syt1 transgene in the null mutant background rescued these phenotypes. We quantified vesicle clustering near T-bars and in a radius of 100 nm, 100–150 nm, and 150–200 nm from the T-bar for the R250H, K379E, S332L and R334H mutant rescue lines and compared them to control rescues. In all cases, synaptic vesicle number proportionally increased in areas (100 nm and 150 nm) near the T-bar, but subsided between 150 to 200 nm away from the T-bar, indicating vesicle clustering is most efficient within a 150 nm radius around T-bars. The individual point mutant lines rescued synaptic vesicle docking directly at the active zone, as well as vesicle accumulation within 100 nm of the T-bar (Figure 9B). 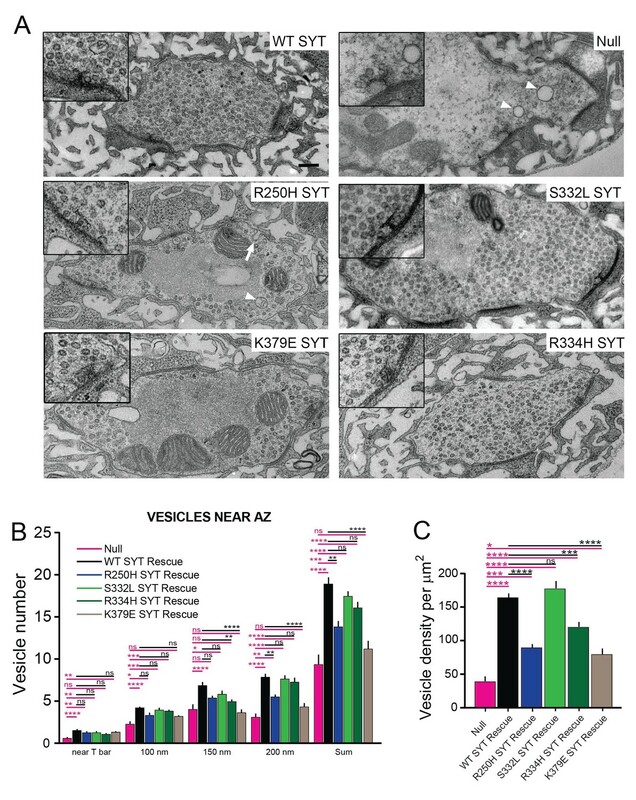 Vesicles were able to cluster around T-bars, even though the total number of synaptic vesicles in the terminal was reduced in several lines (R250H, K379E). As such, the defects in neurotransmitter release observed in these mutants are likely due to post-docking functions for the interactions regulated by each specific residue. Although most of the mutant rescues improved vesicle clustering within 200 nm from T-bar, the K379E strain was only able to rescue vesicle clustering directly at T-bars. In addition, the R250H and K379E mutations showed a strong decrease in total vesicle density (Figure 9C). Interestingly, the R250H mutant caused a significant accumulation of large vacuoles with a diameter greater than 100 nm, even greater than that observed in the null mutant (control rescue: 0.74 ± 0.16 vacuoles per µm2, n = 31; R250H rescue: 2.9 ± 0.5 vacuoles per µm2, n = 38, p<0.001; syt1 null mutant: 1.64 ± 0.28 vacuoles per µm2, n = 16, p<0.01). Other mutations did not display vacuolar accumulation and were not significantly different from control. These vacuolar structures in the R250H mutant were occasionally observed as invaginations from the plasma membrane (Figure 9A, white arrow), suggesting a defect in the endocytic pathway that is separable from the vesicle reduction observed in the K379E mutant. Analysis of FM 1–43 dye loading during 10 Hz stimulation also indicate a role for R250 and K379 in the endocytosis process (Figure 9—figure supplement 1). Following 1 min of loading, labeled synaptic vesicles are distributed uniformly across the bouton periphery for syt1 null animals rescued with wildtype Syt1. In contrast, syt1 null mutants show reduced loading, with small clusters of vesicles distinguishable. The R250H and K379E rescue lines also have diminished loading at 1 min compared to wildtype rescue controls. This defect is more pronounced during shorter stimulations (10 Hz for 30 s), where R250H and K379E rescue lines have reduced loading and show more punctate labeling than controls. To further examine defects caused by R250H and K379E, we used a 10 Hz stimulation paradigm that we previously employed in complexin mutants to examine synaptic vesicle pool sizes (Jorquera et al., 2012). Vesicles from the readily releasable pool (RRP) are required to drive sustained synaptic responses and are mobilized during stimulation to prevent depletion at active zones. To examine if the pool size was reduced in R250H and K379E mutants, we followed release during 10 Hz stimulation over 1000 stimuli. Both the R250H and the K379E mutant rescues displayed a reduction in in the readily releasable pool and sustained release compared to wildtype rescues (Figure 9—figure supplement 1C–E), confirming EM observations of a reduced pool size in these mutants. In summary, these data indicate that the polybasic domain and C2A-C2B domain organization and/or Syt1 multimerization are directly or indirectly required to facilitate synaptic vesicle endocytosis. In contrast, synaptic vesicle docking at the active zone is likely to require multiple interactions mediated by Syt1 that are not disrupted in the individual point mutants. Syt1’s role as the Ca2+ sensor for fast synaptic vesicle exocytosis has been well established, although how it triggers fusion is still being elucidated. A large number of studies have established a role for membrane penetration by the Ca2+ binding loops of the C2A and C2B domains of the protein (Fernández-Chacón et al., 2001; Lee et al., 2013; Mackler et al., 2002; Nishiki and Augustine, 2004; Shin et al., 2009; Yoshihara et al., 2010). These interactions with negatively charged lipid bilayers are a hallmark of C2 domain function, and are thought to generate local perturbations in membrane structure that facilitate rapid vesicle fusion. 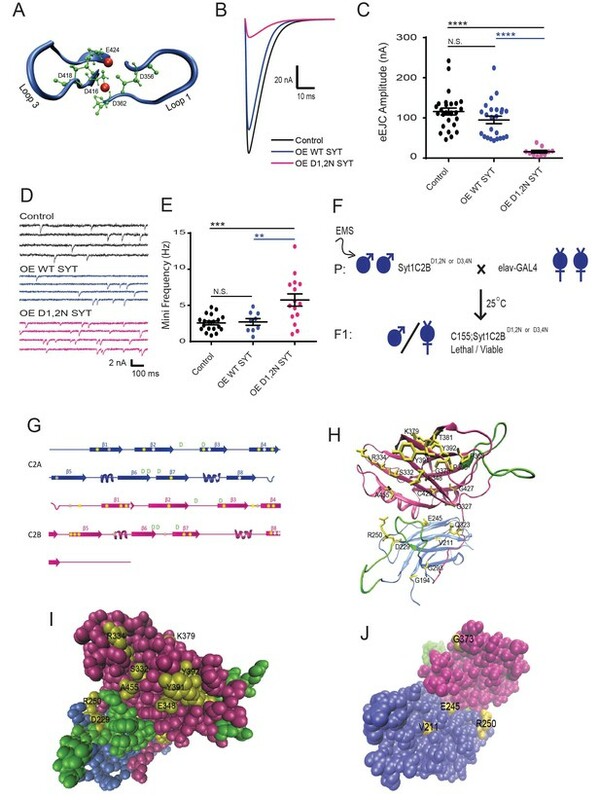 Genetic approaches to specifically mutate the key Ca2+-binding residues within the C2 domains have validated the important nature of this interaction in vivo. These studies demonstrated essential roles for the C2B Ca2+ lipid binding loops, and important, though less essential roles for the C2A Ca2+ binding loops. These approaches relied on targeted mutagenesis of key residues that were first found to be important in vitro based on predicted properties derived from the structure of the protein. Beyond Ca2+-dependent lipid binding, there is still debate about other required interactions mediated through Syt1. The unbiased genetic approach described here identified a set of residues that regulate Syt1 function and suggest functional requirements beyond the Ca2+ binding loops. Several key residues were identified that decorate a surface of the Syt1 C2B domain that had been poorly characterized, but recently emerged as a SNARE complex binding surface on Syt1. Remarkably, we identified mutations in residues S332 (S279 in mammalian Syt1), R334 (R281), Y391 (Y338), E348 (E295) and A455 (A402). All five amino acids form the essential surface interaction residues that dock the C2B domain of Syt1 onto the SNARE complex, based on the recently elucidated primary Syt1-SNARE complex structure (Zhou et al., 2015). Mutations in the S332 and the R334 residues largely abolished the function of Syt1 in driving synchronous fusion. The R334H mutation, which is predicted to be the most essential residue for SNARE binding, failed to rescue synchronous synaptic vesicle release and prevent the increased asynchronous release that is observed in syt1 null mutants. These observations match well with mutations in SNAP-25 and Syt1 designed to disrupt this interaction at mammalian synapses (Schupp et al., 2016; Zhou et al., 2015). In addition, we observed that the R334 mutation abolished the Ca2+ cooperativity of release, even though R334 does not reside near the Ca2+ binding loops of the protein. Although it is unknown what key features contribute to the Ca2+ cooperativity (n = 3 to 5) normally seen for release, the number of Ca2+ ions that bind to an individual Syt1 protein or the number of Syt1 proteins on a synaptic vesicle that contribute to fusion have all been considered as possible determinants. In addition, prior studies found defects in Ca2+ cooperativity in hypomorphic mutants of the SNARE proteins (Stewart et al., 2000). 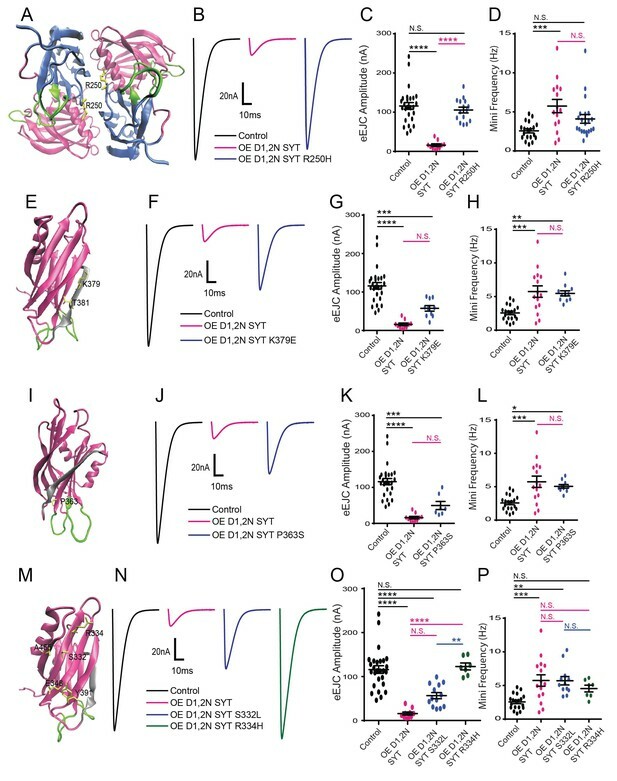 Together with our observations of the R334H mutation, these findings argue that the number of Syt1 molecules bound to SNARE complexes likely contributes to the higher-order Ca2+ cooperativity value observed for release. Although these data indicate the SNARE binding surface of Syt1 is a critical determinant of neurotransmitter release, when this interaction might occur during the fusion process remains to be elucidated. We did not observe a morphological docking defect in the R334H or S332L mutants by electron microscopy, suggesting the Syt1-SNARE interaction is functionally important downstream of synaptic vesicle docking. It is unclear when full assembly of SNARE complexes occurs during the synaptic vesicle cycle. One model suggests full SNARE assembly would trigger bilayer fusion, such that docked vesicles likely contain a partially zippered SNARE complex stabilized by the SNARE-binding protein Complexin. Based on the structure of the Syt1-SNARE complex, it is possible that Syt1 could interact with a partially zippered SNARE complex that contains Complexin. This would allow the Syt1-SNARE interaction to play a role in orienting the Syt1 C2 domains near the site of future membrane interactions, serving as a scaffold for the fusion process. Beyond the defect in synchronous release, the R334H mutant also fails to clamp asynchronous release and the enhanced spontaneous release observed in syt1 null mutants. As such, a Syt1-SNARE complex interaction after docking but before fusion would allow the complex to be stabilized and primed for Syt1-membrane interactions triggered by Ca2+. Syt1 could also interact with the plasma membrane in such a scenario via its polybasic C2B stretch, which lies on the opposite side of the SNARE binding surface (Figure 5). This complex could reduce spontaneous and asynchronous release, with Syt1 sandwiched between the plasma membrane and the SNARE complex. Ca2+-triggered lipid binding would be predicted to rotate the Syt1 C2B domain downward and towards the membrane, facilitating full SNARE zippering and rapid fusion. It is interesting to note that the core residues in Syt1 essential for SNARE binding are not conserved in Syt7, a homolog that has been implicated as the asynchronous Ca2+ sensor for synaptic vesicle exocytosis (Bacaj et al., 2013; Jackman et al., 2016; Liu et al., 2014; Wen et al., 2010). Of the five key residues we identified on the Syt1-SNARE binding surface (S332, R334, E348, Y391 and A455), only S332 is conserved in Syt7. More surprisingly, Syt7 contains homologous mutations identified in our screen (R334C and E348K) in its native C2B sequence that indicates it is unlikely to engage the SNARE complex in the same manner as Syt1. Analysis of differences in mammalian Syt1 and Syt7 also argue for distinct C2B-dependent properties for the two proteins (Xue et al., 2010). It will be interesting in future studies to determine if differential SNARE binding between Syt1 and Syt7 contributes to their distinct roles in regulating synchronous and asynchronous phases of synaptic vesicle fusion. Beyond the data defining an evolutionarily conserved role for Syt1-SNARE interactions in synaptic vesicle fusion, our work also provides insights into how dominant-negative C2B Ca2+ binding mutations disrupt neurotransmitter release. Earlier studies in Drosophila indicated that mutating the Ca2+ binding aspartate residues that line the C2B lipid penetration loops resulted in a dominant-negative disruption of release (Lee et al., 2013; Mackler et al., 2002; Yoshihara et al., 2010). Expression of this DN-Syt1 in Drosophila results in pupal lethality, and formed the basis for our initial screen for intragenic suppressors. It is important to note that the intragenic suppressor screen is unlikely to have hit all the key residues required for normal Syt1 function, as we specifically screened for mutations that block the DN effects of the mutant C2B protein as opposed to native Syt1 activity. The importance of defining how Syt1 with defective C2B Ca2+ binding disrupts release is highlighted by recent findings that indicate this effect is conserved in humans. Two multigenerational families were identified with autosomal dominant mutations in the Ca2+ binding pocket of the C2B domain of human Syt2, a Syt1 homolog enriched in the PNS (Herrmann et al., 2014; Whittaker et al., 2015). These patients display peripheral neuropathy and dysfunctional synaptic transmission at neuromuscular junctions (NMJs). From our genetic suppressor screen, it is clear that the mutant DN Syt1 protein is likely to engage and disrupt core mechanisms of Syt1 that lead to the reduction in neurotransmitter release. The screen revealed that altering SNARE binding (discussed above), C2A domain Ca2+ binding (D229N), C2B domain lipid interactions (P363S), multimerization and/or C2A-C2B domain interactions (R250H), and the polybasic C2B surface regulated Ca2+-independent lipid binding (K379E) all lead to a suppression of the dominant-negative effects on release. Each of these interactions also function during the normal synaptic vesicle cycle based on our in vivo rescue experiments with the point mutants expressed in the wildtype Syt1 protein lacking the Ca2+ binding C2B mutations. Given the positioning of the R250H mutation near the dimer surface observed in the Syt1 crystal structure, we explored this residue in more detail. Molecular modeling indicated the Syt1 dimer is likely to be stable in vivo (Figure 5), with dimer stability disrupted by the R250H amino acid substitution. If R250H disrupts the ability of mutant Syt1 to bind to and inactivate endogenous Syt1, that could prevent the ability of the mutant protein to interfere with release. Our prior studies of Drosophila Syt1 have suggested the protein is likely to function as a multimer (Lee et al., 2013; Littleton et al., 1994), consistent with a dimerization defect. An alternative model is that R250 plays a key role in stabilizing the interaction between the C2A and C2B domains (Figure 4), such that loss of an intramolecular C2A-C2B domain interaction blocks the DN effects on release. Single molecule experiments indicate that Syt1 in solution represents an ensemble of C2 conformations (Choi et al., 2010), and a subsequent modeling study suggested these conformations have tightly interacting C2 domains (Bykhovskaia, 2015). Recent observations indicate that a stable C2A-C2B interface is also important for Syt1 activity both in vitro and in vivo (Evans et al., 2016). Our molecular modeling indicates the normal C2A-C2B monomer stability of Syt1 is disrupted by R250H, consistent with a potential non-dimerization role for this residue as well. Consequentially, this mutation is likely to destabilize Syt1 conformations that are functional in vivo. However we cannot rule out other possible effects of R250 on Syt1 function. The R250 residue is situated in proximity to the C2A Ca2+ binding pocket and could potentially compromise C2A lipid binding as well. Future studies will be required to differentiate which of these functions of R250 are key for Syt1 activity. In vivo, Syt1 R250 fails to rescue the amount of synchronous fusion, although the timing of release and the suppression of asynchronous events are normal. There is also a striking defect in the ability of the R250 mutation to suppress the enhanced spontaneous release and to properly modulate synaptic vesicle density. As such, R250-mediated interactions regulate both the exocytotic and endocytotic functions of Syt1 in vivo. In summary, our genetic analysis of suppressors of Syt1 C2B Ca2+ binding mutations have highlighted a key role for multiple Syt1 functions during neurotransmitter release, including an essential role for the Syt1-SNARE binding surface during the final stages of fusion. TCTTCAGGATCT (Syt1 3’ c-myc Xba1). These constructs were injected into a yv; attP third chromosome docking strain by BestGene Inc. (Chino Hills, CA). All constructs allowed use of the Gal4/UAS expression system to express the transgenic proteins. UAS-Syt1 transgenes were expressed using a GAL4 driver under the control of the pan-neuronal C155 elav promoter in either control white or syt1 null (syt1-/-) backgrounds. Null mutants lacking endogenous Syt1 were generated by crossing syt1N13, an intragenic Syt1 deficiency (Littleton et al., 1994), with Syt1AD4, which truncates Syt1 before the transmembrane domain (DiAntonio and Schwarz, 1994). Postsynaptic currents from third instar male larvae at the wandering stage from the indicated genotypes were recorded at muscle fiber 6 of segment A3 using two-electrode voltage clamp with a −80 mV holding potential in HL3.1 saline solution as previously described (Jorquera et al., 2012). Final Ca2+ concentration was adjusted to the desired level indicated in the text. For evoked and mini analysis, n refers to the number of NMJs analyzed, with no more than two NMJs analyzed per animal, and with animals derived from at least three independent experiments. For determining Ca2+ cooperativity of release, 9 recordings were performed for each indicated concentration, with n indicating the total number of recordings in the 10 different Ca2+ concentrations. Data acquisition and analysis was performed using Axoscope 9.0 and Clampfit 9.0 software (Molecular Devices, Sunnyvale, CA, USA). Motor nerves innervating the musculature were severed and placed into a suction electrode so action potential stimulation could be applied at the indicated frequencies using a programmable stimulator (Master8, AMPI; Jersalem, Israel). Electron microscopy and quantification of SV distribution were performed as previously described (Akbergenova and Bykhovskaia, 2009), with the exception that sections were cut at 60 nm thickness and stained with 2% uranyl acetate. For EM quantification, n refers to the number of NMJ boutons analyzed from at least three independent experimental animals. To assay endocytosis, preparations were stimulated for 0.5 or 1 min at 10 Hz in the presence of the lipophilic dye FM 1–43 (2,5 µm). Immediately after stimulation, preparations were rinsed in FM 1–43 free solution and incubated for 1 min with ADVASEP−7 (100 µm) to help remove non-internalized FM 1–43 dye. Preparations were fixed for 10 min in 4% paraformaldehyde, washed for 5 min and stained for 2 hr with anti-HRP Alexa647 antibody. Preparations were imaged using 63X water immersion lens after 10 min post staining wash. To estimate the level of FM 1–43 dye internalization, the HRP positive NMJ area was selected using Volocity 6.3 (Perkin Elmer) software and total FM 1–43 fluorescence was normalized by HRP area. Electrophysiology analysis was performed using Clampfit 10 software (Axon Instruments, Foster City). Statistical analysis and graphs were performed using Origin Software (OriginLab Corporation, Northampton, MA, USA). Statistical significance in two‐way comparisons was determined by a Student’s t‐test, while one-way ANOVA nonparametric analysis was used when comparing more than two datasets. The P values associated with one-way ANOVA tests were adjusted P values obtained from a post hoc Tukey’s multiple comparisons test or a Sidak’s multiple comparison test as indicated. Appropriate sample size was determined using GraphPad Statmate. In all figures, the data is presented as mean ±SEM. Statistical comparisons are with control unless noted. An Excel file with all source data and statistical comparisons has been included as ‘Source Data and Statistical Analysis’ that contains individual spreadsheets labeled with the figure number and includes all primary data. Molecular modeling was performed as previously described (Bykhovskaia, 2015). The 2R83 Syt1 structure (Fuson et al., 2007) was used for an initial approximation of the Syt1 monomer and dimer. The optimized structure was placed in a water box (100 × 100×100 A for the monomer and 120 × 120×120 for the dimer) constructed using Visual Molecular Dynamics Software (VMD, Theoretical and Computational Biophysics Group, NIH Center for Macromolecular Modeling and Bioinformatics, at the Beckman Institute, University of Illinois at Urbana-Champaign). Potassium and chloride ions were added to neutralize the system and yield 150 mM KCl. Single point mutations were created using VMD. MD production runs were performed on the Anton supercomputer with Desmond software (Shaw et al., 2009) through the MMBioS (National Center for Multiscale Modeling of Biological Systems, Pittsburg Supercomputing Center and D.E. Shaw Research Institute). The initial equilibration (100–200 ns) was performed employing NAMD Scalable Molecular Dynamics (Phillips et al., 2005) (Theoretical and Computational Biophysics Group, NIH Center for Macromolecular Modeling and Bioinformatics, at the Beckman Institute, University of Illinois at Urbana-Champaign) at the XSEDE (Extreme Science and Engineering Discovery Environment) Stampede cluster (TACC). Both NAMD and Desmond simulations were performed employing the CHARMM22 force field (Mackerell, 2004) with periodic boundary conditions and Ewald electrostatics in NPT ensemble at 300K with a time-step of 2 fs. The trajectory analysis was performed employing VMD and Vega ZZ (Drug Design Laboratory) software; PyMOL software was used for visualization, molecular graphics, and illustrations. In production runs, the time-step between trajectory points was 240 ps. Journal of Clinical Investigation 125:1670–1678. The Journal of Biological Chemistry 269:5735–5741. Journal of Biological Chemistry 273:13995–14001. Journal of Biological Chemistry 273:32966–32972. How does synaptotagmin trigger neurotransmitter release? Annual Review of Biochemistry 77:615–641. Nature Structural & Molecular Biology 15:827–835. The Journal of Biological Chemistry 268:26386–26390. The Journal of Cell Biology 150:1125–1136. Molecular Biology of the Cell 27:979–989. The Journal of Biological Chemistry 275:28180–28185. The American Journal of Human Genetics 95:332–339. Journal of Molecular Biology 387:284–294. Molecular Biology of the Cell 17:5211–5226. Molecular Biology of the Cell 19:5093–5103. Journal of Computational Chemistry 25:1584–1604. The Journal of Comparative Neurology 436:4–16. Journal of Biological Chemistry 279:12574–12579. High Performance Computing Networking, Storage and Analysis, 10.1145/1654059.1654126. Is synaptotagmin the calcium sensor? Current Opinion in Neurobiology 13:315–323. Thank you for submitting your article "A Synaptotagmin suppressor screen indicates SNARE binding controls the timing and Ca2+ cooperativity of vesicle fusion" for consideration by eLife. Your article has been favorably evaluated by a Senior Editor and three reviewers, one of whom is a member of our Board of Reviewing Editors. The reviewers have opted to remain anonymous. In this work, the authors identified residues of Syt1 that can suppress the dominant negative phenotype of certain calcium binding region mutants of the C2B domain. An intragenic screen was performed to find suppressors of the dominant negative C2B mutant. The authors then focused on those that did not involve a premature stop-codon or a deletion mutation, and that did not alter expression levels as assessed by Western analysis. Several groups of single-site mutants were analyzed in more detail. Moreover, for a selected subset, the mutants were expressed on a Syt1 null background. Several sensitive residues were found that localize to the polybasic region, a putative site of an intra-C2 domain contact, and the interface between Syt1 and the SNARE complex as found in the crystal structure by Zhou et al. (2015). 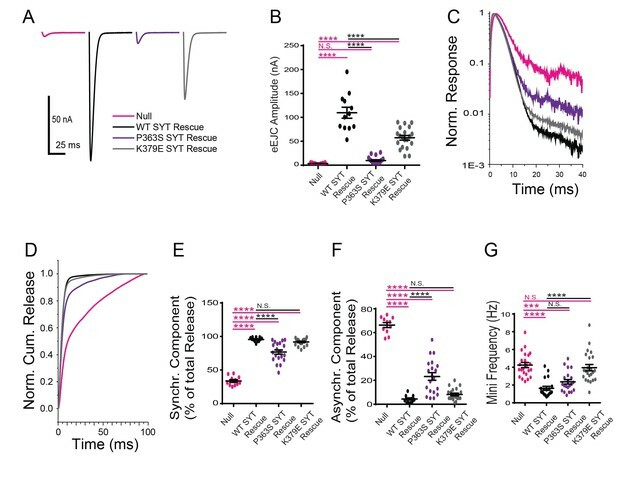 The mutations that were tested in the Syt1-SNARE complex interface produced the strongest phenotype, including greatly decreased rapid synchronization and calcium cooperativity. This work provides new insights about the importance of residues of Syt1 that are not involved in calcium binding, but rather the interaction with the SNARE complex, the membrane, and putative intra-C2 domain interactions. 1) In the first paragraph of the subsection “Intragenic suppressors in Syt1 C2BD1,2N rescue evoked release defects” the authors mention their observation that overexpression of Syt1 with mutations in both the C2A and C2B calcium binding sites did not cause dominant-negative defects in release, as also shown their previous work (Lee et al., 2013). However, Wu et al. recently found that simultaneous mutation of both C2A and C2B calcium binding sites are still dominant negative in mouse neurons, more so than the C2B mutant itself (D. Wu et al., Postsynaptic synaptotagmins mediate AMPA receptor exocytosis during LTP. Nature, 1-21 (2017). The authors are encouraged to discuss and speculate about the reasons for this interesting difference. 2) In addition to S332 (S279 in rat) and R334 (R281 in rat), residue Y391 (Y338 in rat), also plays a key role in the Syt1-SNARE interface found by Zhou et al. (2015). Indeed, according to Table 1, Y391 is also a suppressor of the dominant negative C2B mutant. Did the authors perform any additional experiments with the Y391 mutant? 3) The authors speculate that the R250H (R199 in rat) suppressor may be related to intra-C2 interactions. However, the crystal structure of Syt1 by Fuson et al. (2007) is only one possible conformation between Syt1 C2 domains. Single molecule FRET experiments by Choi et al. (NSMB 17, 318, 2010) showed a rather large distribution of intra-C2 conformations, of which the conformation observed by Fuson et al. (2007) is a major conformation, but not the only one. Thus, the relatively mild suppressor action by R250H may be related to existence of multiple conformations between the C2 domains. Another possible explanation may be related to the proximity of R250 to the calcium binding loops of the C2A domain: the mutant may affect the membrane binding affinity of the C2A domain, which may in turn influence the phenotype of the C2B dominant negative mutant. The authors are encouraged to discuss these possibilities, and perhaps tone down or even remove the rather speculative computer simulations. 4) Figure 3, 6 and 8: please provide recordings from UAS-R250SYT OE flies and some of the other isolated mutants in a wild type background. Does expression of these mutants in syt1 null background rescue lethality? 5) Figure 9A. The authors claim that R250H does not rescue the enlarged vesicle size phenotype, can the authors provide a quantification of large vacuoles with a diameter greater than 100 nm in syt1 null animals? Does this mutation actually cause an endocytosis defect? They should provide additional evidence that the mutation R250H affects endocytosis (e.g. FM1-43). 6) As mentioned by the authors, Syt1 has an acknowledged role in SV endocytosis, and perhaps some of the mutations that decrease the total SV number impair proper endocytosis. Do the authors have any means of addressing this directly or indirectly for their mutations? And as a related concern, although gross trafficking to the synaptic bouton appears normal in these point mutants, can the possibility be excluded that there is less Syt1 on the SVs (perhaps due to inefficient retrieval from the plasma membrane), and this decrease drives some of the exocytic defects? And lastly, is it possible to quantify the synaptic abundance of Syt1 to see if there's a correlation with overall synaptic abundance and function? 7) Many interesting regulatory steps in the process of SV exocytosis can be parsed into either SV priming or SV fusion probability. Although none of the mutations analyzed by EM showed a detectable shift in the number of SVs docked immediately at the T-bar, there was no effort made to measure or comment on the size of the readily-releasable pool and the impact of these Syt1 mutations on its size. Is there a technical limitation that prevents using sucrose or depleting stimulus trains examine this? 8) In the calcium cooperative analysis of Figure 8G, it would be useful to plot the fit coefficients in the blank space next to the figure for comparison. The major effect is R334H vs. WT and everything else is sort of in between. I'm not sure if those differences would be statistically different using a multiple comparisons test rather than T test, but the major interesting case was the R334H mutation anyway, and that effect looks highly significant. Also, what is the error range reported along with the fit value? Is that an uncertainty generating from the fitting algorithm or is that a standard error from fits to multiple replicates of the eEJC vs. Ca curves? And finally, why wasn't the P363S mutation examined for changes in cooperativity since this may directly impact the calcium-binding site? 9) In general, for the physiology and EM studies of the Syt1 mutant, the transgenic animals were not compared to wild-type animals, only the Syt1 null rescued with wild-type Syt1. The WT transgenic rescue is certainly the main appropriate control strain for comparisons but it would be nice to see an example of null rescue compared to a wild-type animal perhaps along with the initial rescue experiments in Figure 3. Although the basis of this species-specific difference is unclear, the C2A domain from Drosophila could be more essential for proper positioning of the DN C2B domain that would allow it to poison the fusion machinery, a property lost by simultaneous disruption of its Ca2+-activated lipid binding properties. There could, of course, be alternative explanations as well, but this would potentially explain the differences. We cite the Wu paper in our revised manuscript to note this difference, and provide a brief discussion. Indeed, Y391, as well as E348 and A455, came out of our screen as residues that appear at or near the recently identified Syt1-SNARE interface. We recovered four independent suppressors that alter Y391, so clearly this residue is critical for the DN Syt1 effect. However, we focused on S332 and R334 as representative of this group of Syt1-SNARE surface interaction residues, and did not do additional experiments on the other hits located on this surface of the protein. We list these hits in our table, and they support our conclusions on the importance of the Syt1-SNARE interface, but given the time involved in a detailed characterization of each mutant allele and the requirement to make a host of transgenic animals for each hit we characterize, we focused on picking representatives of each category to further analyze, in this case S332 and R334. As suggested, Syt1 in solution is likely to represent an ensemble of C2 conformations. Both FRET experiments and MD simulations (Bykhovskaia, Biophys. J. 2015, 108:2507-20) agree with this view. Indeed, the simulations presented in our study for naïve Syt1 (Figure 4A-D) also agree with this model, since they show a conformational transition for C2 domains within a time period of only 3 microseconds. Importantly, we also show that the R250H mutation has a drastic effect on the conformational dynamics of C2 domains. 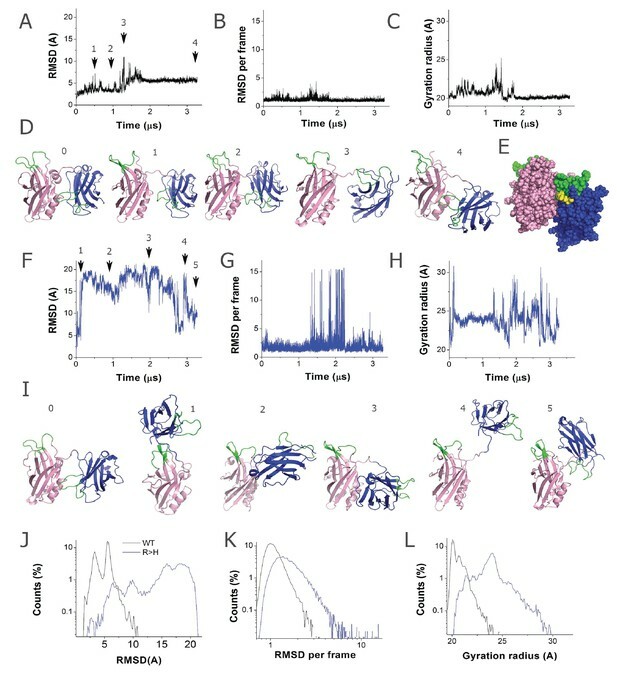 Specifically, as shown in Figure 4I-L, within the same 3 microsecond time period, the mutated protein undergoes multiple conformational transitions, including separations and major rotations of the domains. It would be surprising if such major alterations in C2 domain dynamics had no effect on Syt1 function. Even if the functional Syt1 conformation differs from the one obtained by crystallography in Fuson et al. (2007), this conformation would still likely be destabilized by the R250H mutation, since this mutation enhances conformational transitions of the Syt1 C2 domains. We discuss this in more detail in the revised manuscript. We agree, however, that the R250H mutation could also modify membrane binding of C2A, as suggested by the referee. We included this alternative possibility in the revised manuscript. Indeed, it is very interesting to know if disrupting other interactions mediated by Syt1 can lead to a DN phenotype, as the reviewer suggests. To test our current mutations, we completed a new set of experiments where we overexpressed the Syt1 mutant constructs in a wildtype background. We found that none of the mutations we characterized in the current study (R250H, K379E, P363S, S332L and R334H) caused any significant changes in either evoked or spontaneous release compared to either controls or overexpression of wildtype Syt1. As such, mutations in the C2B Ca2+ binding pocket appear to be unique so far in their ability to poison the fusion machinery at the Drosophila NMJ. We have included this new data in the revised manuscript, and as a new figure (Figure 2—figure supplement 2). In terms of whether the mutant proteins can alter the lethality of the syt1 null, we performed a new set of experiments to examine their rescue ability. We include this new data in Figure 3—figure supplement 2, panel D. The wildtype Syt1 transgene robust rescues the lethality, with R250H and K379E also generating very significant rescue. In contrast, S332L has a very little rescue, with R334H and P363S providing no rescue at all. These effects on viability match very well with their ability to rescue the null physiology defects, as R334H and P363S have essentially no rescue of the synaptic release defects. As requested by the reviewers, we have quantified the EM phenotype of the syt1 null in relation to the large vacuolar phenotype we observe. Whereas the wildtype rescue has 0.74 ± 0.16 vacuoles per µm2, syt1 null mutants have significantly more (1.64 ± 0.28, p<0.01 vacuoles per µm2). The R250H rescue shows an even more dramatic phenotype, with 2.9 ± 0.5 vacuoles per µm2. Why is the phenotype even worse in the R250H mutant? We hypothesize that since the null releases so few vesicles on the exocytotic side, this accumulation of excess membrane has less opportunity to develop. The R250H has far more evoked release than the null, which we propose leads to a more robust defect in the endocytic process. We have included this new quantification in the Results section. In addition, we examined FM 1-43 loading at 30 seconds and 1 minute during a 10 Hz stimulation train in the two mutants that show less synaptic vesicles by EM – R250H and K379E. Following 1 min of loading, labeled synaptic vesicles are distributed uniformly across the bouton periphery for syt1 null animals rescued with wildtype Syt1. In contrast, syt1 null mutants show reduced loading, with small clusters of vesicles distinguishable. The R250H and K379E rescue lines have diminished loading at 1 min compared to controls. 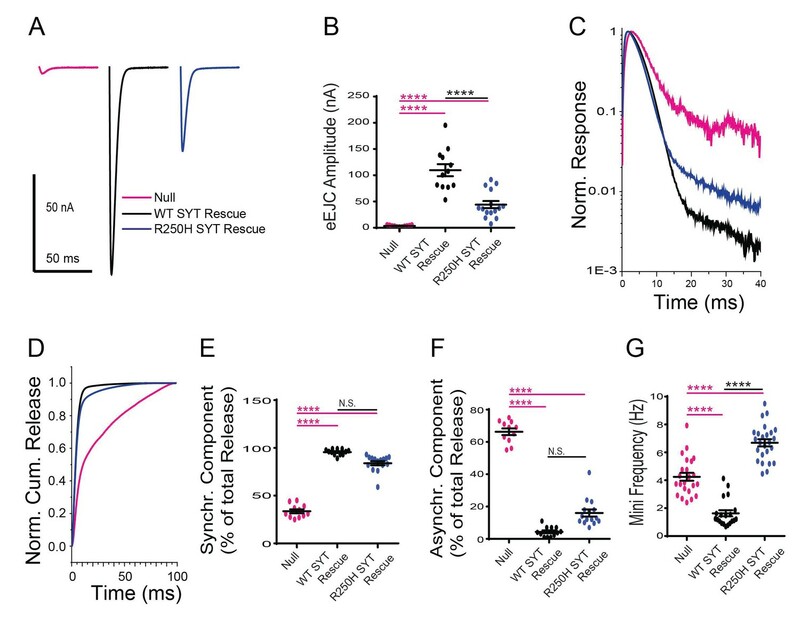 This defect is even more robust during shorter stimulations (10 Hz for 30 seconds), where R250H and K379E rescue lines have reduced loading and show more punctate labeling than controls, consistent with the reduction in synaptic vesicles observed by EM. We have included this data as a new figure (Figure 9—figure supplement 1). To address this point in more detail, we added FM 1-43 uptake assays as described in point 5 above. We also have completed more physiology on the two mutants where EM points to an endocytotic defect – R250H and K379E. We used a 10 Hz stimulation paradigm that we previously employed in complexin mutants to examine synaptic vesicle pool sizes (Jorquera et al., J. Neuro. 32:18234-18245, 2012). Three major functional pools of synaptic vesicles have been described at many synapses – the immediate releasable pool (IRP), the ready releasable pool (RRP) and the reserve pool (RP), including the Drosophila NMJ (Rizzoli and Betz, 2005). Vesicles from the IRP contribute to phasic neuronal responses and are associated morphologically with docked vesicles (Elmqvist and Quastel, 1965; Schneggenburger et al., 1999; Delgado et al., 2000). Vesicles from the RRP drive tonic responses and are mobilized during stimulation to prevent depletion at active zones. Synaptic vesicle recycling is largely responsible for sustaining release after mobilization, with a minor contribution from the RP (Heuser and Reese, 1976; Delgado et al., 2000; Zucker and Regehr, 2002). By examining the steady-state response following depletion of the IRP and RRP, we can estimate the effective recycling pool size. Using this method, we find that indeed both the R250H and the K379E mutant rescues display defects in the synaptic vesicle pool size compared to wildtype rescues. We have included this data, together with the FM 1-43 staining, in a new figure (Figure 9—figure supplement 1). In terms of whether the mutants could alter the levels of Syt1 on synaptic vesicles, we have no way of directly testing that. Our immunocytochemistry shows the mutant proteins are trafficked normally to the NMJ and are found in the typical halo pattern at individual synaptic boutons, similar to what is normally seen for synaptic vesicle proteins (Figure 3—figure supplement 1A-D). Therefore, we have no reason to suspect such a defect. Sucrose use in Drosophila is quite variable and not a great tool due to muscle contraction issues associated with that high a level of release at the NMJ, so we have avoided it in all our previous studies. We can do depleting stimulus trains, as the reviewer points out, and as we have done in point 6 above. However, these are labor-intensive experiments, so we have not completed this analysis for the full array of mutants – we focused on those that displayed a vesicle density defect by EM (R250H and K379E) in the current study. We do plan a follow-up study on an additional subset of the lines, particularly those that disrupt the Syt1-SNARE interface, where we will perform the full analysis of pool sizes. We are currently combining these rescue lines with complexin mutant strains to determine how the Syt1-SNARE binding dynamics interfaces with Complexin-SNARE binding in terms of vesicle docking and priming, vesicle clamping and Ca2+ activation of the release machinery. It will be exciting to examine the interplay between these two key regulators of SNARE biology (Syt1, Cpx), and we plan on incorporating more exhaustive experiments on the physiology in this context. This information has been added to source data files linked to each figure, these provide the raw data and the statistical analysis for every single experiment in our study, in keeping with eLife’s new emphasis on data reproduction. Every experimental result for each figure panel is provided in the relevant source data file. As requested by the reviewer, we have included all our source data for the cooperativity measurements, including Hill fits and errors. We did not include the P363S mutation in this analysis, as we think the effects of this mutation, based on its location in the C2B pocket, is likely to be similar to Ca2+ binding mutants we previously generated and characterized in this region (Yoshihara et al., 2010). For the remaining mutants, as the reviewer notes, we see some effect on cooperativity in all the lines, perhaps not surprising given how central Syt1 is for Ca2+ activation of fusion. However, the R334H mutation stands out in this regard, as it completely abolishes cooperativity, similar to the null mutant, and argues for a key role for the Syt1-SNARE interaction in driving an aspect of the cooperativity puzzle. Indeed, we previously found that release is quite sensitive to Syt1 levels. To avoid genomic position effects on transgenic expression in our current study, we used site-specific transformation via the ΦC31 integrase system to place the mutant Syt1 rescues in the same genomic locus. Although this ensures equal transcriptional levels of our control and mutant rescues, the transgenes are expressed at lower levels compared to wildtype Syt1, which is why all of our controls use the Syt1 wildtype rescue for comparison. We have included a new western analysis of Syt1 expression levels in the rescue condition in Figure 3—figure supplement 1, panel E, that shows the transgenic proteins are expressed at similar levels to the wildtype rescue. However, they are only expressed at ~20% of the levels of endogenous Syt1 (see new Figure 3—figure supplement 2). We document the physiological effects of this reduction in the overall level of wildtype Syt1 in a new figure – Figure 3—figure supplement 2, where the amount of synaptic vesicle release is decreased, consistent with Syt1 levels being an important modulator of fusion. Although the overall amount of vesicle fusion is reduced compared to the levels of native Syt1, release is still fully synchronous in the wildtype rescue, and mini frequency elevation is full restored, as shown in Figure 3. The wildtype rescue also fully rescues viability of the null mutant as shown in Figure 3—figure supplement 3D. For all our figures, we subsequently compared the mutant rescues with the wildtype rescue expressed from the same genomic insertion site. This work was supported by NIH grants NS40296 and MH104536 to JTL, NIH grant MH099557 to MB and JTL, and AR063634 to RBS. We thank the Bloomington Drosophila Stock Center (NIH P40OD018537), the Developmental Studies Hybridoma Bank, Noreen Reist (Colorado State University) for providing cDNA, Yao Zhang for technical support and Steven Worthington (Institute for Quantitative Science, Harvard University) for statistical support. MD simulations were performed at the Anton supercomputer (DE Show Research and Pittsburg Supercomputer Center) and at XSEDE resources (Stampede supercomputer at TACC). © 2017, Guan et al.